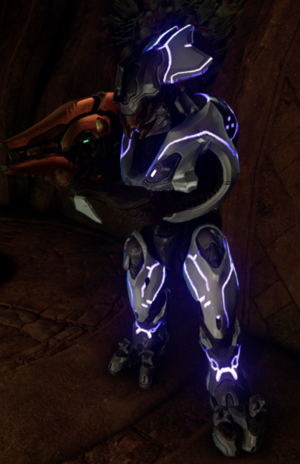 Ke 'Nzahz is a Sangheili Colonel present in Warzone simulations. He is outfitted with a white Commander-class harness, a type-1 energy sword, and a type-58 fuel rod cannon. Killing him earns the player a Legendary Takedown achivement. However, the round will not end, until the 4 spec-ops elites that also spawn are killed. Although he is only a Legendary Boss, he uses the Mythic Elite model. This is the same for other Elites, such as Primes, when they appear in the final round.